Kuusamo is a town and municipality in Finland. Step out of the city life by going to Ruka and Karhunkierros. Explore the numerous day-trip ideas around Kuusamo: Posio (Riisitunturi National Park & Korouoma Canyon), Pieni Karhunkierros Trail (in Juuma) and Suomussalmi (Martinselkonen Wilds Centre, The Silent People, & more). 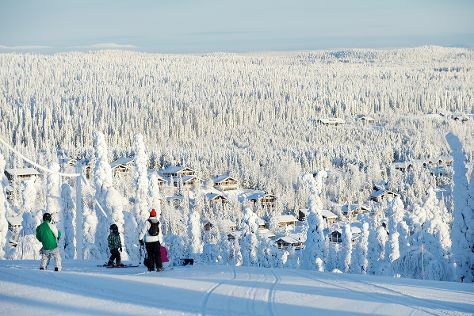 And it doesn't end there: fly down the slopes at Salla Ski Resort, get in on the family fun at Angry Birds Activity Park, experience rural life at Palosaari Reindeer and Fishing Farm, and explore the world behind art at Hannu Hautala Nature Photography Centre. For maps, more things to do, and tourist information, read our Kuusamo vacation planner . In February in Kuusamo, expect temperatures between -5°C during the day and -12°C at night. Cap off your sightseeing on the 9th (Sat) early enough to travel back home.